Arroz caldo is a thick rice soup (“lugaw” in Tagalog) popular in the Philippines which is usually a meal on its own. Though the name sounds Spanish which translates to “rice soup”, the dish is of Chinese origin. It mainly consists of rice boiled in a ginger-based broth along with meat and some seasonings. 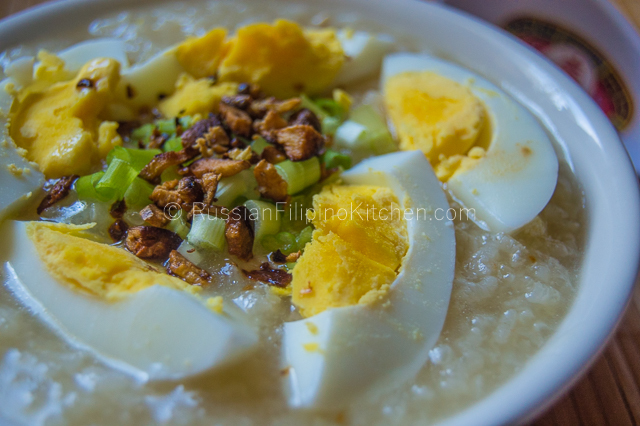 Upon serving, it is topped with fried garlic bits, green onions, slices of boiled eggs and calamansi. It is a delicious and flavorful dish that is both filling and satisfying, perfect as a snack or meal. This recipe uses chicken breasts although it’s common to use chicken with bones in for richer flavor in the broth. If you have chicken legs or drumsticks, you can also use it. You just have to shred the meat later on before serving. Also, I use sticky rice instead of regular rice which gives the soup a much thicker consistency. 1. In a big pot, heat oil ¼ cup of oil on high. Scoop about a teaspoon of garlic and sauté together with onions till garlic is slightly brown and onions are translucent, about one minute. 2. Add ginger and sauté for another minute until fragrant. 3. Throw in chicken and sauté until browned a little. Season with a pinch of salt and pepper. 4. Pour in the chicken broth and water. 5. Add the fish sauce and rice. Stir and bring to a boil. Lower heat to medium low and simmer for 25-30 minutes, stirring occasionally. 6. While soup is simmering, get a smaller pot, place the eggs and add water just enough to cover. Bring to a boil and simmer for 10 minutes. Remove from heat and place in ice bath. Peel eggs and cut into quarters. Set aside. 7. In a saucepan or small frying pan, heat 2 tbsp oil and fry the remaining minced garlic until golden brown. Set aside. 8. Turn off heat once soup is done. It should have thickened and rice has mostly disintegrated. 9. Ladle into individual bowls and top with sliced eggs, green onions, and fried garlic bits before serving.